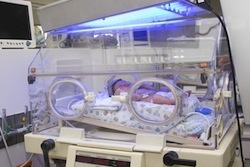 Researchers from the Universidade Federal do Parana have reported cases of tooth defects in neonates intubated soon after birth. All infants included in the study were intubated in the hospital after preterm delivery - prior to the 35th week gestation. The average gestation at birth was 31.7 weeks. Children were evaluated for oral health around two years of age. Oral examinations revealed a rate of enamel defect of more than 86% in children intubated at birth. The longer the intubation time the more likely and severe the defect. Non-intubated infants suffered the same tooth defects in less than 14% of cases. The primary defect affected tooth enamel. The teeth most affected by intubation were the upper left, upper right central incisor and upper left incisor. Researchers did not divulge long-term side effects of enamel defects or suggest changes in intubation practices to prevent such defects. Source: de Oliveira Melo NS, da Silva RP, de Lima AA. The neonatal intubation causes defects in primary teeth of premature infants. Biomed Pap Med Fac Univ Palacky Olomouc Czech Repub. 2013 Feb 26. DOI: 10.5507/bp.2013.004.